This notable house was made famous by a widely published photograph taken by Julius Schulman, depicting two women lounging while suspended over the city lights. Since then, the home has been photographed for many print ads, editorials, commercials and movies. The house was designed by Pierre Koenig for Buck Stahl as part of a case study competition to build affordable housing. It was built in 1959 and has 2,300 square feet of living area. The home has had a major influence on the indoor-outdoor nature of subsequent Los Angeles architectural design. 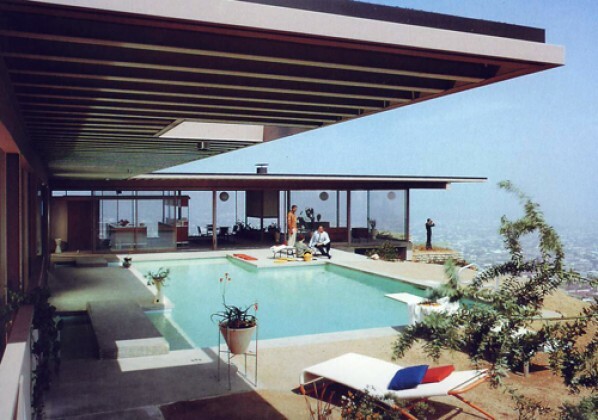 The American Instiute of Architects listed the Stahl House on “America’s Favorite Architecture” list. The home is still owned by the Stahl family, and they make it available for tours on a regular basis. See the link below. This entry was posted on Wednesday, November 17th, 2010 at 5:30 am	and is filed under architecture & design, notable homes. You can follow any responses to this entry through the RSS 2.0 feed.